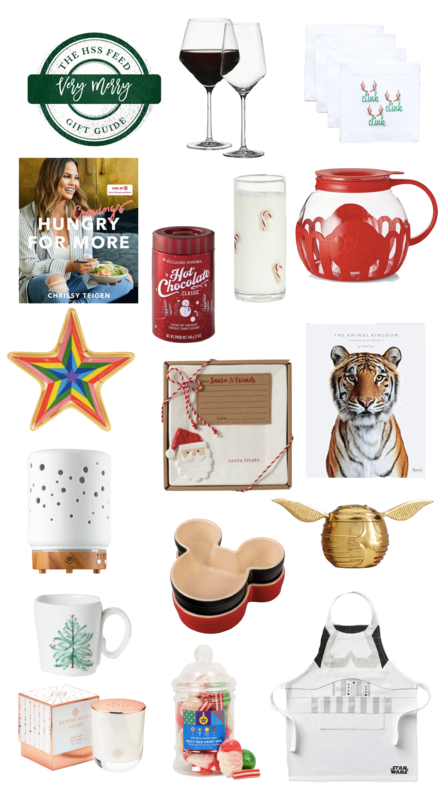 And first gift guide of the year is here! I said on Instagram last week that I was thinking of waiting till after Thanksgiving but enough people said that they wanted to see things sooner that here we are. Home gifts have gone from really challenging to really fun for me to buy over the last few years. Maybe its as we’ve gotten more settled into our home, with our family, that I have gotten better at ideas and it’s become a more fun category for me to shop for. With home gifts around this time of the year, I try to stay a little more seasonal and light, worrying less about if something will match someone’s house perfectly, but rather choosing something that will be fun, festive and more family-friendly. This year I’m also working hard to keep almost all of my gift picks under $100 and I think with home gifts, that is completely doable without a problem. This Santa plate ($20) is adorable for Christmas Eve and would make for a fun gift to take to a cookie making party or any family. Bring a bottle of wine for mom and dad and you’re all set! I love my essential oils but the Young Living diffuser I have is not the prettiest thing I’ve ever seen. If you have an oil lover in your life, try a pretty diffuser like this one and your favorite combo for the season. I hear Christmas Spirit, Peppermint and Joy are all great ones. If you’re Disney people like we are, these little Mickey Ramekins are a cute idea! I would pair them with a bag of your homemade cookies or peppermint bark for the recipient to snack on later! I can never have enough Lettermade cocktail napkins. Malia does such a great job and makes the most beautiful things. There are also TONS of options so whether you want to go festive or traditional monogram, you’ll find something you like. Have you seen enough fashion cocktail table books lately? Well try something different like this Animal Kingdom book. Clint’s friend from college is actually the photographer of this book and he’s super talented!